A photograph showing the Future Farmers of America banquet at Solomon High School in Solomon, Kansas. 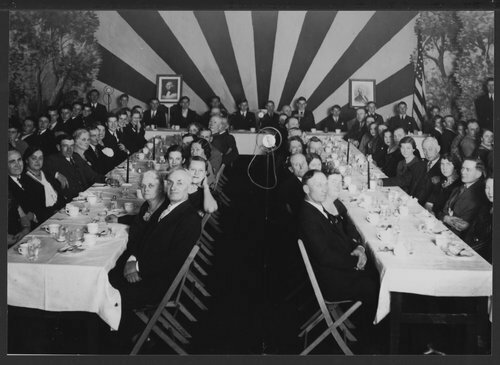 Joseph Michael Kelley is seated at the head table, fifth from the right, and his parents Timothy Francis and Agnes Kelley are seated at the left table, fourth and fifth from the front on the left side. Joseph was active in Future Farmers of America and served as secretary and vice president in the organization. An article on the banquet was published in the Solomon Tribune, January 30, 1936.